There is plenty of information out there for skiers: which are the best ski resorts for beginners, or Austria’s best resorts for experts, for example. Seefeld is one of Austria’s top ski resorts for non-skiers for the same reason it isn’t a particularly good choice for hard-core skiers. With the ski area being relatively small and unchallenging, the fact that there is a popular winter destination here is a testament to the alternatives on offer. Many locals will tell you that winter visitors are split between downhill skiers, cross-country skiers (Seefeld is one of the best places in the world for this sport) and those who have no wish to ski at all. The mountains of the Karwendel and Wetterstein ranges and the altitude of the Seefeld plateau mean that there is a lovely backdrop for the kilometres of cleared walking trails through the snow. The railway station on a line between Munich and Innsbruck means that it is easy to visit those destinations on a day out of the resort. Zell am See has a beautiful position between the mountains and the lake and is big enough offer plenty of interest to those who are not planning to ski on a winter holiday. It is a popular destination for weddings and romantic getaways in the winter months – some use the mountain lifts for services in the chapel at the top of the ski slopes. Back down in the town, there are walking trails around (and across) the lake, while the railway station has good connections through to Salzburg. The only negative for non-skiers is perhaps the bustle and noise of the busy town, as there is plenty of road and rail traffic (although a tunnel diverts much of the through traffic on the road). 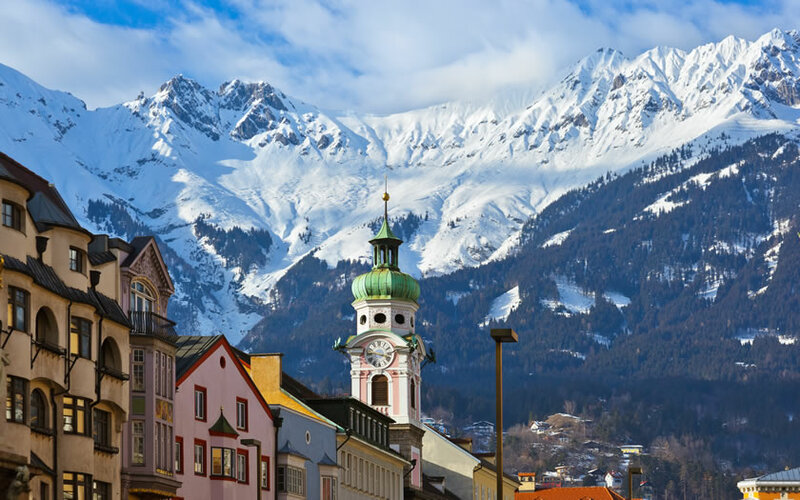 Innsbruck makes it onto this list while Salzburg doesn’t because it is possible to access the ski slopes from the centre of the city. So while the skiers can head up to Igls or the Nordkette, non-skiers are in their elements exploring the interesting nooks and crannies of the capital of the Tyrol. The pedestrian centre offers the Golden Roof, the Imperial buildings and plenty of shops and restaurants to while away the hours. Non-skiers can also make the trip up the Bergisel to admire the ski jump and the lifts to the Nordkette are set up for normal pedestrians to use as part of a sightseeing trip (so skiers and non-skiers can use the lifts). The only drawback for non-skiers may be persuading the skiers in their party that there is enough skiing to keep them interested (there is). The Stubai valley is one of the most picturesque locations near Innsbruck. There are high mountains on either side of a relatively flat and wide valley floor and a glacier ski area at the far end. Non-skiers will enjoy the scenery and the different villages and areas to explore on the walking trails or bus system. The lift system on the glacier means that they too can explore the high mountain world of the Stubai Alps, while the bus services put Innsbruck within easy reach. There is still plenty of sporting activity for those who don’t wish to ski – paragliding or snowshoe walking are available in the area. On the negative side the villages are fairly small and are pretty much given over to skiing in the winter. Kitzbühel is the grande olde dame of Tyrolean ski resorts – it’s not just a place to ski, it’s a place to see and be seen. Of course, that means that there are plenty of attractions on offer for those who would be concerned that a day on the ski slopes might destroy their new hairdo. Even if most non-skiers might not fit into that category, it doesn’t mean that they can’t take advantage of what is on offer. There is plenty of opportunity for consumption in the town itself – whether that means buying or eating and drinking or pampering. But Kitzbühel’s position pretty much equidistant from Salzburg and Innsbruck means that there are opportunities to visit those cities as well. The famous Kitzbühel nightlife offers something for everyone, from the Casino to swank restaurants to the lively pubs.